Magic converges with magic for me today, as my first E-Book flies off the pages. When Hummers Dream is a short story that immediately precedes book one of my novel series, What the Heart Knows. It’s the story-before-the-story, a special preview that lets you into Milford-Haven before the launch of the novel. Over the next few days, it’ll start appearing in Amazon’s Kindle store, Barnes & Noble’s Nook store, and will soon be available for any and every E-Reader. It’s free, or less than one dollar. You’ll be able to find links at MaraPurl.com. And with it comes the glorious watercolor cover art by Mary Helsaple. I had a real-life experience that sparked this story. While spending a summer performing in my favorite town of Cambria, California, a hummer flew into a glass wall. My companions at lunch that day thought the bird dead. But I spent a long hour in a privileged solitude with the tiny bird, my heart thrilling when it came back to life and flew off the palm of my hand. Each friend who witnessed the event later gave me a gift: a gold hummingbird charm; a hummingbird etching; a hummer of carved wood; a glass hummer that still hangs in my office window. People often ask me where I get my story ideas. The ideas come from many places, most of them located squarely in my imagination. Yet people and situations I observe or experience often inspire, even if from a distance. And then, there are the stunning up-close things that happen right before my eyes. How could I not write about the little bird who visited my heart? The only other earthly creatures to make such an impression were the whales I helped to save on a Greenpeace voyage. And I write about them too, in essays, articles, and in my upcoming novels. The gargantuan and the minuscule, each have touched the heartstrings that bring forth a song of belonging, of intelligence, of transcendent communication. Non-fiction writing is about facts. But fiction is about truth. So, of course, my short story goes beyond the events of that summer day, and carry the reader both into the heart of my artist-protagonist, and into the mind of the hummer she meets. His part of the story is—literally—a flight of fancy. But who’s to say it’s not just as real as the painter who does her best to capture enough of his essence to bring him back to life? So enjoy a brief journey to Milford-Haven, just long enough to discover how the world might look . . . When Hummers Dream. We are in a drought stage here in Texas, but I am still able to water our fruit trees from the back yard well via hose and sprinkler. I love the times when the hummers come to hover in the spray, soaking up the moisture, taking a little natural bath, enjoying the cool relief from the rising sun. 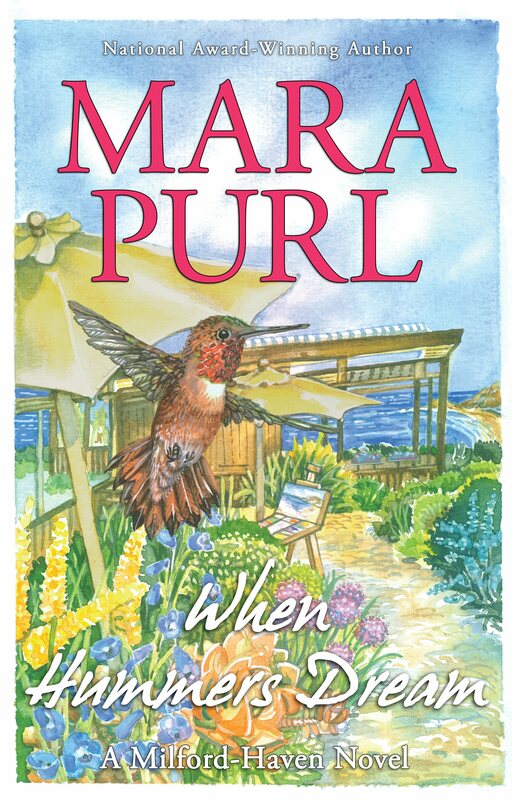 Such a miracle…as all hummer are…and Mara’s story is a fun read!